I’m pretty sure I got my first taste of garlic when my grandmother made her famous pommes de terre sarladaises: she sautéed scalloped potatoes with duck fat in her cast-iron Dutch oven, crusted by decades of faithful service. Toward the end of the cooking time, she’d throw in a generous quantity of slivered garlic and a handful of chopped parsley. If we were lucky, golden chanterelles were combined with the potatoes. The whole kitchen smelled of garlic. She also served a soupe au pain every night where thick slices of country bread soaked in a flavorful garlicky broth. More often than not, it also included vegetables from the garden: cabbage, carrots, dried fava beans… It was a far cry from the elegant potages served in Paris restaurants! When vegetables were not available, farmers would simply make a tourin blanchi, a garlic soup bound with an egg. It truly earned the nickname of soupe du pauvre. It’s simple, rustic, and unexpectedly smooth. Just a few weeks ago, Rick and I drove to Cadours, a small village of Haute-Garonne, during their annual Fête de l’Ail Violet. It was the perfect opportunity to get acquainted with their AOP purple garlic, witness how it is peeled and braided, and sample some tasty garlic soup. A peacock entirely made of garlic was awarded First Prize this year. Another surprise: a contest featuring stunning models completely made of garlic –cloves, skins, stalks– and displayed under the imposing 19th-century brick halle. Not as old as la halle de Grenade but a nice piece of architecture nonetheless. I confess that I was not familiar with this purple garlic from Cadours: it only earned its Appellation d’Origine Protégée in 2017. But it prompted me to do some research on French varieties of garlic beyond the generic “white” variety. Three varieties of garlic have been awarded some distinctive protections. Ail Rose de Lautrec IGP is the most famous one. This high-quality pink garlic is grown in the Tarn near Albi and obtained its Indication Géographique Protégée in 1996. It has a subtle and slightly sweet taste. It is said to keep for a full year. Ail Violet de Cadours AOP exhibits a notable purple color on the skins. The heads are fairly large. The aroma and flavor assertive. In hot preparations, some sweetness balances its strength. It’s marketed as early as July, before any other French garlic. Ail Fumé d’Arleux IGP is a pink garlic cultivated in the Hauts de France (the old Nord-Pas de Calais region.) It’s braided then smoked. The process gives the heads a copper color and confers a woody note to the garlic. If you love garlic, you’d probably enjoy going through a blind tasting to compare white, pink and purple garlics: make several frottes where a clove of garlic is rubbed against a piece of toasted country bread. It often served as my grandfather’s lunch when he was a child. The taste differences mostly reveal themselves when the various garlics are used raw. Simmered in a soup, they loose any harshness and become exquisitely smooth. Melt the duck fat in a thick-bottom pot and lightly sauté the garlic and onion; do not allow the vegetables to color. Sprinkle the flour, mix well and add the water. Bring to a boil, add salt and pepper to taste, lower the heat, and simmer for about 30 minutes. Separate egg whites and egg yolks into two bowls. Beat the yolks with a fork, add the vinegar, and one Tbsp of soup. Take the pot off the stove, add the egg yolk mixture to the soup, and whisk briskly. Add the whites, mix and whisk thoroughly. Place a slice of bread in each bowl and pour the hot soup over the bread. La soupe au pain: bread soup. The broth and vegetables (whole or in chunks) are poured over a slice of bread. In rural areas, la soupe au pain was often meant to be a complete meal. Le potage: a smoother, more refined soup. The components are cooked down or pureed to produce a creamier texture. Since my return to the farm I’ve been feeling very domestic. It is a retour aux sources to the place that’s been part of me, since my very first visit: I was two months old. Throughout their retirement, my grandparents raised ducks, chicken, and rabbits. They also grew vegetables to feed animals (maïs, betteraves, topinambours) and humans (pommes de terre, haricots verts, asperges, petits pois, fèves.) There was also a small potager planted with leeks, carrots, tomatoes, and a variety of lettuces. Fruit trees dotted the fields. Growing your own produce and eating in season was a double-edged sword. First, you got all excited when harvesting the first green beans; two weeks later, you tried to invent new dishes to use the above-mentioned vegetables; three weeks into the season, you were insanely tired of équeuter the beans and canning the seemingly endless crop. My quetsche tree is ready for its close up. The farm is no longer in an active state but some of the fruit trees remain. We arrived too late for cherries and apricots but August blessed us with an abundance of plums, more than enough to share with family, birds, and wasps. By all accounts, this year was a bumper crop for fruits à noyaux. Although I frequently purchased local produce from Farmers’ markets while living in California, nothing beats the taste and texture of a perfectly ripe fruit, just picked from the tree and eaten on the spot. But when strong winds knocked down a large branch of my quetsche tree, we found ourselves with an abundance of riches. Not being equipped for canning at the moment, I resorted to making compotes, clafoutis, and tarts. If I find myself in a similar predicament next year, I might just have a local bouilleur de cru distill my excess fruit and turn it into eau de vie. The most exciting thing for me was to feast on varieties of plums that I rarely –or never– encountered in the US. The Mirabelle plum is virtually unknown there: in fact, I can’t really find a translation for it. Some call it a “cherry plum” because it is the size of a fat cherry; one of my suppliers used to label it “fancy plum”, which was more confusing than helpful. Those who have seen and tasted a mirabelle always recognize its (often flecked) dark yellow skin, yellow flesh, and sweet flavor. It’s a specialty of the Lorraine area where 80% of the production is grown. Reines-Claudes stay green even when ripe. My personal favorite is the Reine Claude (greengage), named after the wife of King François 1er. Round and firm, its skin is green even when the plum is ripe; its flesh is green as well. It retains a touch of acidity which balances its sweetness. I think they make fabulous tarts: they soften but do not lose too much juice. Very prevalent in our area is the Quetsche (damson) and its cousin the Prune d’Ente (the one they dry to make those wonderful French prunes in Agen.) The oval purple fruit brightly contrasts from the thick green leaves of the tree. Its light red flesh is a bit juicier than the Reine Claude. Two weeks ago, I found myself in the middle of the perfect plum storm: I actually had baskets of all three varieties at the same time! Not wanting to play favorite, I felt under obligation to celebrate them all in one dish. Preheat oven to 375º F. Drop the pastry into a 12” tart mold. Wash, half and pit the plums. Spread the almond meal evenly on the surface of the dough. Arrange the plums in crust; sprinkle with brown sugar. Bake for 30 minutes or until crust is golden brown. Living in California has its advantages: one of them is the abundance of fresh produce, which makes it a paradise for cooks. I got an early education in that field, pun intended: my paternal grandparents returned to a farming/gardening life when they retired and I spent countless vacation hours helping them in the vineyard, harvesting asparagus, shelling fresh peas, trimming green beans for canning, gathering potatoes for winter storage, and picking strawberries to be served that very evening. For me, there were only two kinds of strawberries: the plump round ones that I picked in grandpa’s garden and the tiny elongated kind that grew wild in his woods. The latter (fraises des bois) I would just enjoy on the spot while hunting for mushrooms as it took a lot of time and effort to gather enough for a family dessert! The strawberries grown in the garden received more consideration: they could turn color and ripen quite quickly and had to be closely monitored. I always wanted to harvest them at their finest, late in the afternoon, after they had soaked in the warmth of the sun. I would rinse them in the cool water from the well, hull them, then set them up in grandma’s white saladier until it was time for dessert. We ate on their own, perhaps with a bit of sugar or paired with the fromage blanc made by Monsieur Adam, our neighbor. Grandpa being diabetic, sugar was off limits for him; he usually enjoyed his berries in a bowl, doused with the red wine he made from his own grapes. I didn’t pay that much attention to which variety of berries he grew back then: why would I bother when they always tasted so delicious, freshly plucked from the garden and consumed within hours? As I got involved in the specialty food business, it became my duty (et mon plaisir) to quiz my suppliers about what kind of strawberries they used in the various jams, preserves or conserves I sold. Cigaline is a variety derived from the Gariguette but with a touch less acidity than its "sister"
Since I usually fly back to France every May, I’ve had many opportunities to linger at the outdoor markets and study what is displayed on the stalls. There are more than one hundred different varieties of strawberries but three of them are top-ranked in France. The Gariguette is a real star: medium-sized and elongated, with an orangey red color, it’s an early variety that’s sweet with a touch of acidity. 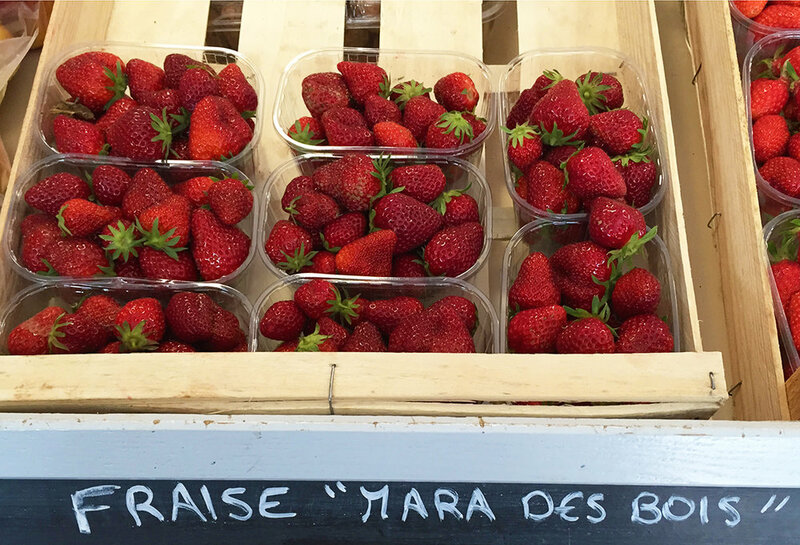 The Mara des Bois is also much sought after: it’s fleshy and juicy, exhibiting a brilliant deep red color and a round shape, with the sweet and musky aroma of wild strawberries. The Charlotte is a favorite among children: bright red color, heart-shaped, firm, sweet, and juicy, it makes beautiful tarts and jams. Once in a while, you might even find white strawberries like the Anablanca, one of the oldest varieties (white strawberries were brought back to France from Chile in 1728 by explorer Jacques-Cartier.) Surprisingly, their taste is reminiscent of… pineapple! When you have access to freshly picked fruits, simple preparations are best to showcase their flavor. There is a produce stand on my way home from work and that Chinese family has been growing strawberries for decades: the strawberry beds sit right behind the tiny shed and the fruits are picked daily. As soon as the harvest starts, I stop by and pick up a pint or two: they are so perfectly ripe, they don’t keep more than a day or two. Most of the time, we just eat them out of hand. Sometimes, I add some cream. And sometimes, I tip my hat to Grandpa and serve them with red wine. Wash, dry, and hull the strawberries; halve or quarter them depending on size and reserve in a large bowl. Pour the wine into a saucepan; add sugar, cinnamon, star anise, and balsamic vinegar. Bring to a boil then simmer 5 minutes. Remove cinnamon and star anise; pour over the strawberries. Let cool then refrigerate until ready to serve. Divide into 6 individual bowls and sprinkle with crushed pink peppercorns. 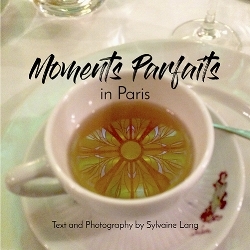 Sylvaine’s tips: use a light red wine (Beaujolais, Gamay, or Cabernet Franc, for instance.) Pour the wine mixture on the strawberries while it's hot: the fruit will be slightly poached. If pink peppercorns are not available, you can replace them with freshly ground black pepper. La Chandeleur was just a few days ago and Mardi Gras is coming up next week. With apologies to Carl Sagan, it’s fair to say that the French consume “billions and billions” of crêpes: in Brittany alone, they have been common fare since the 13th century. Savory galettes can make a complete meal; sweet crêpes de froment are served as a dessert or as a snack. I was in New York during Restaurant Week in 2011 and treated myself to Megu, a Japanese restaurant near the United Nations. For dessert, I chose the Matcha Mille Crêpes, an ethereal green tea flavored cake, a tower of crêpes layered with pastry cream. A year later at Le Colonial, the very same cake was listed on the menu and delicious memories flooded my mind. Miam miam! I found out these Mille Crêpes were the specialty of Lady M, an upscale pastry shop on the East Side. Many variations are possible, either by adding a flavor to the crêpe batter or to the pastry cream. I had brought back a few bars of Pralinoise that I incorporated to make a delicious praliné cream. The assembly is a bit time-consuming but doesn’t require any particular skill. And it’s surprisingly easy to slice. This video will show you a few tricks. I won’t be in my own kitchen on Mardi Gras so a mille crêpe is not in the cards this year. The appeal of individual crêpes lies in giving everyone the opportunity to choose their favorite fillings but the mille crêpes cake will elicit oohs and aahs from everybody at the dinner table. Next time, I’m trying François Payard’s recipe. Make the crêpes: Combine the flour, cocoa powder, sugar, and salt in a large mixing bowl. In another bowl, whisk together the eggs, milk, and orange zest. Incorporate them gradually into the dry ingredients, whisking constantly with one hand as you pour them with the other. Doing this slowly will prevent lumps from forming. Whisk in the butter, then the cream. Strain the batter over a bowl to make sure that it is smooth, then whisk it again so that it is thoroughly combined. Cover the batter, and refrigerate for at least 2 hours or overnight. Whisk the batter well. Place a small crêpe pan or nonstick skillet (about 8 inches in diameter) over medium heat. Pour about 2 teaspoons vegetable oil in the pan to grease it. Once it is hot, use a 1/4 cup measuring cup or a small ladle to pour a little less than 1/4 cup of batter in the pan. There should be just enough batter in the pan to coat the bottom in a thin layer. Tilt the pan in a circular motion so that the batter is evenly spread in the pan. After about 2 minutes, the edges of the crêpe should start firming up. Use a spatula to lift a side of the crêpe and flip it over. Cook on the other side for about 1 minute, then remove the crêpe to a plate. Repeat the process until all of the batter is used, piling the crêpes one on top of the other as they are cooked. If the crêpes start to stick to the pan, add a little more oil. Cover the stack of crêpes with plastic wrap, and refrigerate until cool, up to 1 day. Make the Pastry Cream: Line a shallow pan, such as a 9-inch square cake pan or a small rimmed baking sheet, with plastic wrap. Bring the milk to a boil in a medium saucepan over medium-high heat. Whisk in the green tea powder. Meanwhile, combine the sugar and cornstarch in a medium bowl, and whisk in the yolks. Continue whisking until the yolks turn a very pale yellow. Slowly pour a fourth of the milk into the yolk mixture, whisking constantly to keep the yolks from curdling. Once the milk is well incorporated, return the mixture to the saucepan over medium heat, and cook, whisking constantly and scraping the bottom and sides of the pot with the whisk to prevent lumps from forming, until it becomes very thick and bubbles start popping from the center of the pan for at least 20 seconds. You need to bring it to a boil so that the cornstarch gets activated. Remove from the heat and whisk in the butter. Pour the pastry cream into the prepared pan and cover it with plastic wrap to prevent a skin from forming. Let it cool to room temperature, and then refrigerate it until it is completely cool, up to 1 day ahead. Whip the heavy cream at medium speed in the bowl of an electric mixer fitted with the whisk attachment until it holds soft peaks. Whisk the pastry cream to a creamy texture, then gently fold in the whipped cream with a spatula. Assemble the Cake: Place one of the cooled crepes on a serving platter. With a small offset spatula, spread a very thin layer (about 1/16 inch) of the green tea pastry cream over the crepe, going all the way to the edges. Place another crepe on top and repeat the process until the cake is 2 to 3 inches tall. Refrigerate for about 1 hour before serving, up to 6 hours ahead, so that the cake has time to set. At the beginning of December, Mom would always buy a large box of boules praliné to usher in the holiday season. She stored the box in the dining room buffet and would pull it out at the end of dinner so we could all enjoy a sweet treat: a sure sign the holiday season had started. I was also very fond of marrons glacés and she would purchase a box of them as well, along with the less expensive brisures, not as presentable but just as tasty. Historically, the purpose of candying fruits was not to celebrate Christmas but to extend their shelf-life by replacing their moisture with sugar, a natural preservative. Fruits confits (also called fruits glacés) are not difficult to make but they are labor intensive and require space. The basic principle is to immerse the fruit in syrup, simmer it for a while, pull it out, let it dry, and repeat the operation over several days until the fruit has been saturated. I confess that I’ve never attempted to candy my own chestnuts but there is a prolific Meyer lemon tree in my mother-in-law’s backyard. Last weekend, I decided to make a batch a candied lemon zest. It’s an easy and tasty introduction to home-made candied fruits: because the zest is thin, the whole process can be completed in a couple of days. Pack the candied strips in pretty tins or cellophane bags closed with a festive ribbon: they make irresistible hostess gifts. Cut both ends of the lemons. Quarter the lemons and cut each quarter into 4 or 6 strips: each strip should be about 3/8” thick. With a spoon, scrape the membrane and pulp away from the strips of zest and reserve. Fill a saucepan with water and bring to a boil. Add the lemon zest and blanch for 5 minutes. Strain and repeat the process two more times to remove the bitterness. Set the peels in a colander and drain. Meanwhile, squeeze the juice from the reserved pulp (yes, you may use your hands or pack the pulp in a square of cheesecloth and extract the juice.) Place the sugar, water, and lemon juice in a saucepan and bring to a boil. Add the lemon peels. Reduce heat to medium-low and simmer for about an hour. Drain the peels and set them on a wire rack for 24 hours to air dry. Save the lemon syrup to jazz up a glass of Champagne or moisten a pound cake. Place the sugar in a shallow bowl and roll each peel in the sugar to coat. Store in an airtight container at room temperature for up to one month. Of course, you can use the same recipe with oranges or another citrus.